Intel Core 9th gen processors are surely the best amongst the gaming CPUs when the performance is compared. Among them is the beastly i7 9700K which is one of the strongest CPUs currently available on the market. After the i5 9600K, this is the chip which can max out any game when combined with any high-end graphics card like RTX 2080 or 2080 Ti. But the thing is if you don’t own a good motherboard, you won’t be able to utilize the full potential of this processor although it is just made for that extra juice. Overclocking is its speciality and it can easily go over 5.0Ghz with a decent CPU cooler. This 8 core CPU is the first amongst all the i7s ever made to consist of 8 cores and therefore is a monster in Gaming as well as productivity. 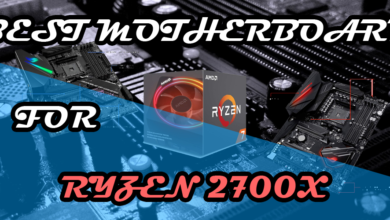 If you are in search for a good motherboard to overclock your 9700K effectively and want the most out of it, then consider the following list or you will end up wasting your money if you don’t know what to buy and what not. 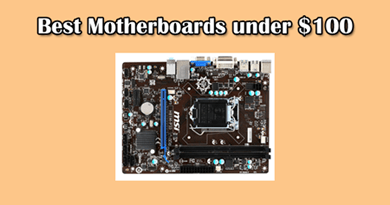 In case you have your eye on a different motherboard than what is listed, then you can let me know in the comments! 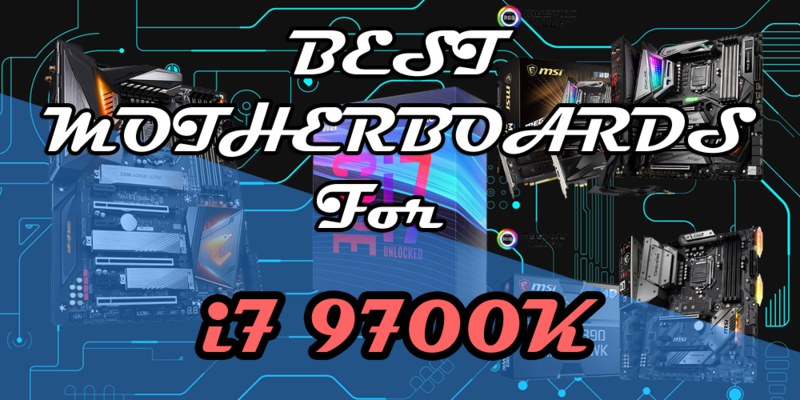 This is the best budget Z390 motherboard for the i7 9700K as it features 6+3 power phases which provide a very decent overclocking that are also cooled by good heatsinks which are covered by an I/O cover for more aesthetical appeal. There are other boards which cost the same but they don’t have all the necessary features that will provide the best value for the money. In this board, not only the VRM is powerful but the layout is also fantastic. 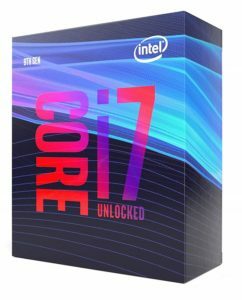 For the i7 9700K, it is a starting point if you don’t have enough money for the motherboard and want decent overclocking and upgradability along with good aesthetics. 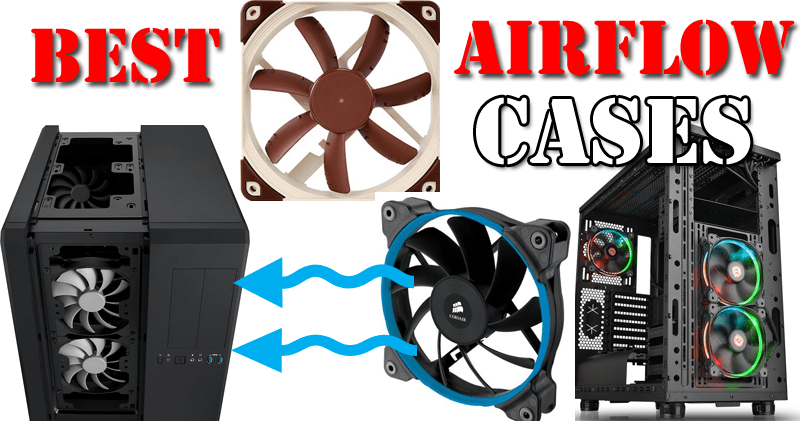 It provides you with 7 headers in total for CPU Fan, Chassis fans and pumps. This is in a single way the best feature of this board which is required to cool down your whole system effectively. For storage, there are 2x NVME SSD M.2 slots out of which one is covered with an aluminium heatsink and the 6x SATA ports are aligned to the right for easy connections. This board can support up to 64GB of ddr4 RAM overclocked up to 4400Mhz which is more than enough but you will hardly need this highly overclocked RAM anyways. Keeping the pros aside, the motherboard has some cons which I believe are justified for the price of $150 but in case you want those features, then you should continue to the motherboards listed below. The board has 4+8 CPU power ports which are “Really” not required. The 8pin power port is enough even for strong overclocking with a custom water loop. Another CON is the absence of any onboard troubleshooting options. It doesn’t have any Power/Reset buttons and an LCD display for reading error codes though you won’t find these features on any budget motherboard like this. 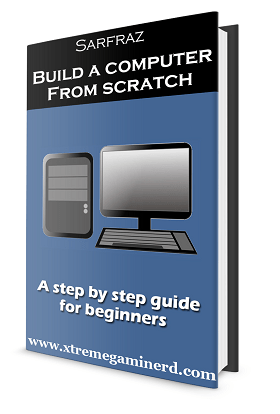 If you can keep things straight and simple from the BIOS and other software, then you don’t need these. 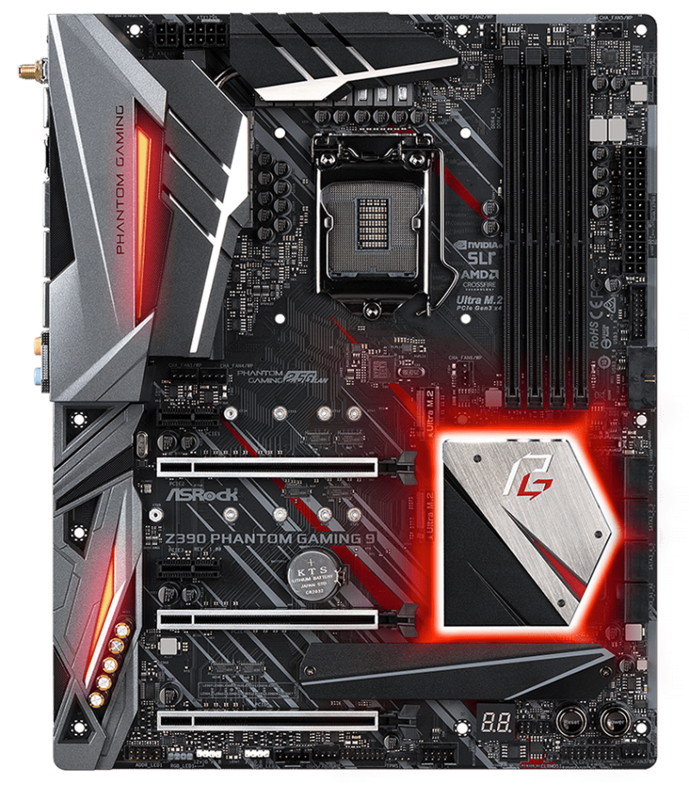 But in case you are looking for a better motherboard with better overclocking and additional features, then continue reading below. 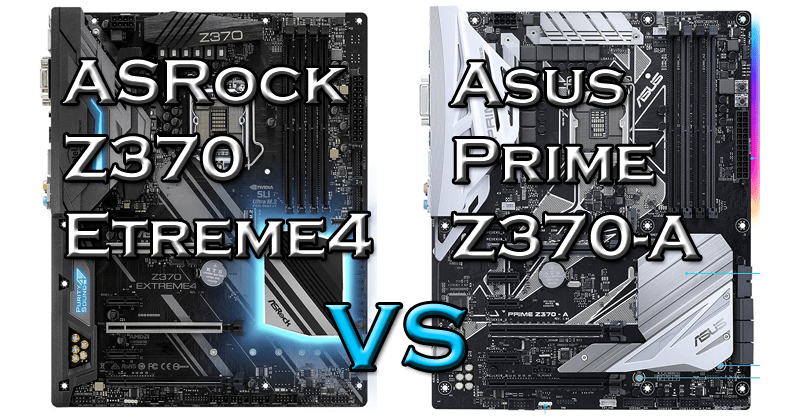 ASRock’s Phantom series for both graphics cards and motherboards are one of the best in their areas. 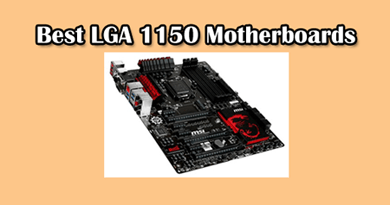 The Phantom series of motherboards provide rock-solid features at good prices that compete with higher-end motherboards. This is the Phantom Gaming 9 that is a combination of great features with great aesthetics. The PCB, in particular, is strong and reliable and all the PCI-E x 16 slots are equipped with Steel Armor for better support. The board features 12 power phase design in its VRM which uses doublers for a better and stable overclock. 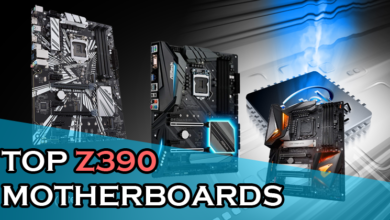 Many motherboards that cost around $200-$250 use doublers for a decent overclocking but this board brings in some more good specs at a cheap rate which other boards don’t have. The chokes it uses are not the simple 40A chokes but uses the 60A chokes that help in achieving better overclocking as the result of improved VCore voltage. Onboard features of this board are particularly on point as it features Power and Reset buttons at the bottom which are the most needed things for quick troubleshooting and an LCD Display that helps you determine the error CODE without opening up your PC cabinet if you own a cabinet with a transparent display. 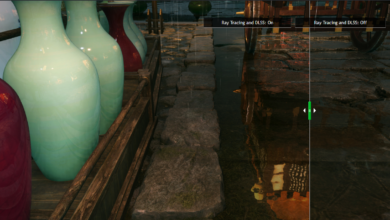 The locations of these buttons and the display are perfectly fine and there is one CMOS Clear button at the I/O from where you can reset everything if you face any difficulty in booting up your system. I chose this motherboard over the other boards like Asus ROG Strix Z390-F Gaming and others due to all these fantastic features. And in case you don’t want to spend a lot, then this is truly one of the best budget Z390 board for i7 9700K. 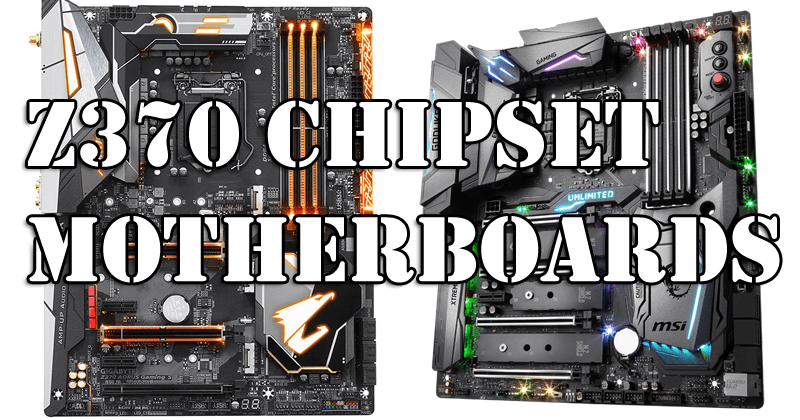 If you remember our Best Z390 motherboards i5 9600K post, you will find this motherboard on the list as the “Best Motherboard” due to the fact that it has no big disadvantages at all. 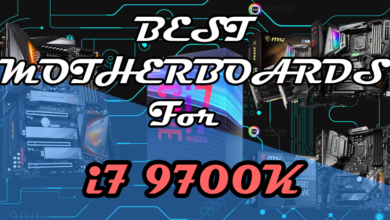 Everything you would need in a perfect motherboard, you will find on this one and it’s one of the best motherboards for i7 9700K if we consider the value we get on the money spent. The board features a powerful VRM with 13 Power Phases which is achieved with the help of doublers and hence, more stability in overclocking. The heatsinks are heavy that should do the cooling better than the other boards listed here. 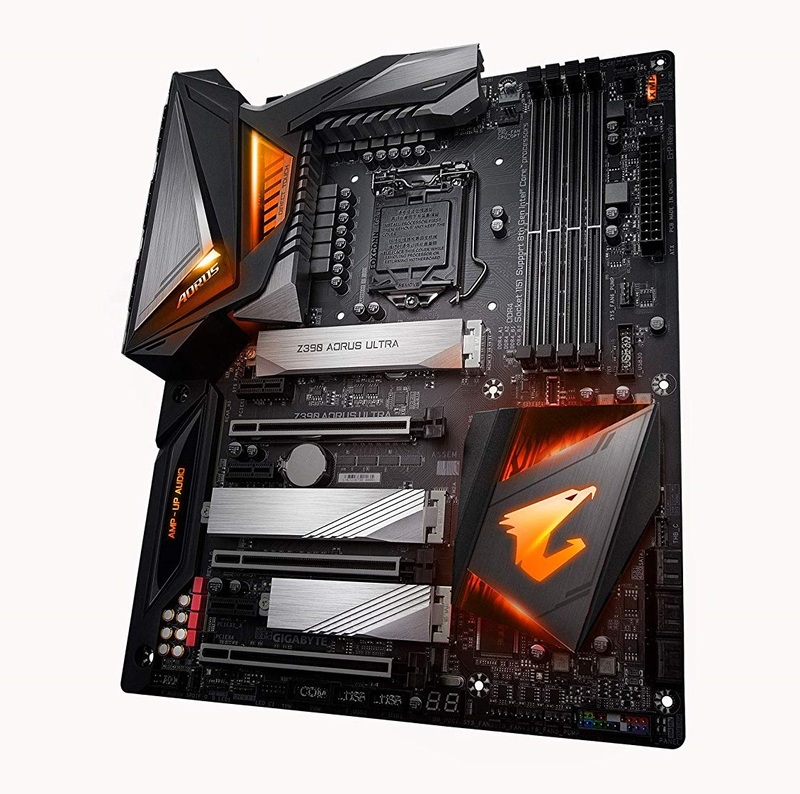 Aesthetically also, this is a beast and the AORUS category of Gigabyte excels in this area. You can control all the lighting effects with the help of Gigabyte APP Center and sync the RGB lights with other parts as well. It comes with Debug LEDs that will help you find the problems easily and you can easily find out if the problem is related to Memory, CPU or Display. The PCI-Ex 16 slots and DIMM slots of this board uses Steel Armor for more strength and reliability and comes with aluminium heatsinks on all the M.2 slots. For cooling, it comes with multiple fan headers and pump headers which you can use for cooling your whole chassis and with RGB headers you can extend the lighting effects to show off your build. In comparison to the MSI MAG Z390 Tomahawk, it comes with One more Fan header and thus more cooling. In simple words, this is one of the top choices for i7 9700K and even for other 9th gen Intel processors if you don’t want to go above $250. But in case you want the best performance with no compromise then head to the next motherboard and buy it if you don’t have any restrictions on your budget. MSI’s GODLIKE motherboards have always been on the top since the trend of overclocking started. 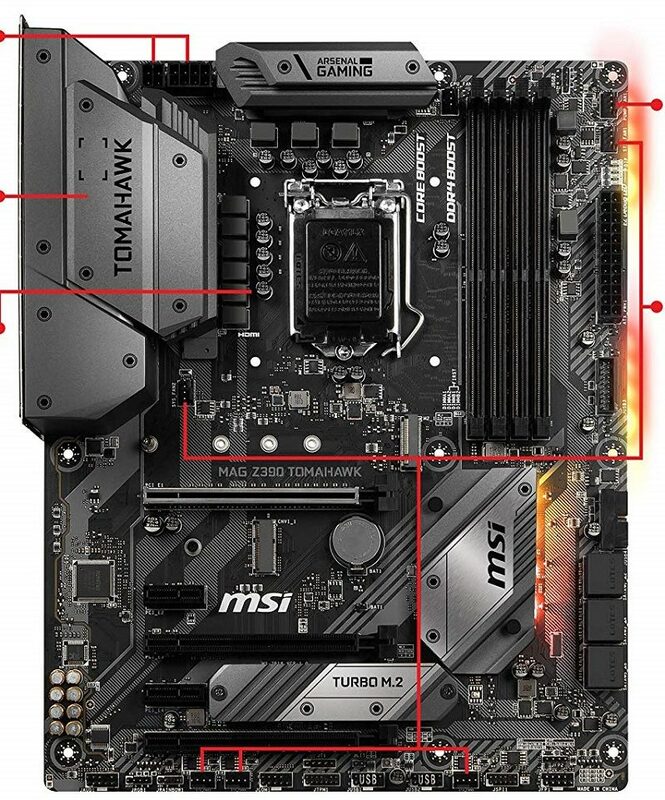 We had motherboards with LGA 1150 sockets and now with 1151 sockets that are dedicated to overclocking so much so that it’s hard to find a better competitor than the MSI’s GODLIKE motherboards. The board has a very powerful exceptional VRM section that uses “18” power phases for stable overclocking although it’s more likely and I think I can say it with surety that this board uses doublers and not actual 18 phases but actually, something like 8+2 power phases as MSI usually practices using doublers on its mid and high-end motherboards. For i7 9700K, you will need this powerful VRM and you will be able to get this chip to full potential. The VRM section which uses a large Infinity Mirror RGB LED zone displays the pre-programmed messages and the post codes for easier troubleshooting and at this heavy price of around $600, there should be no compromise. As this is an enthusiast board, it must have all the necessary features for overclocking easily and solutions for getting out of troubles. For memory, it supports up to 64GB of DDR4 Ram overclocked up to 4600Mhz. As for fast storage, there are 3x M.2 slots that you can use for NVME SSDs- all protected with aluminium heatsinks that will cool down the SSDs in the long run. 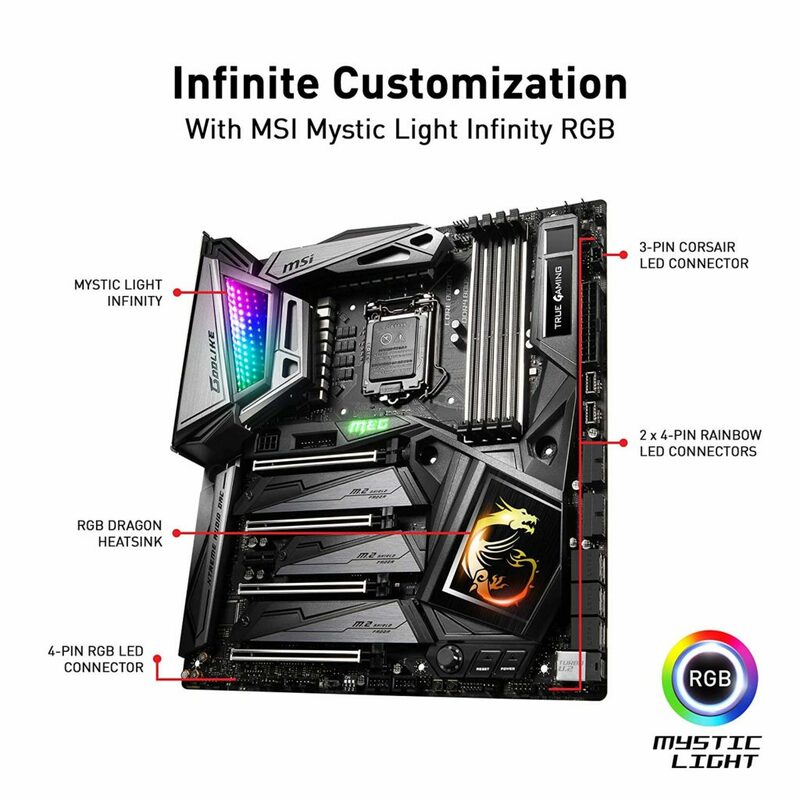 The board comes with MSI Mystic lighting as well, which will ensure that you take the maximum benefit of RGB lighting and sync it with other components as well. The motherboard is also packed with tons of accessories that include SATA Cables, SLI bridge, RGB extension cables, Wifi Antenna, Streaming boost, M.2 Xpander-Z, and many more things. This board comes with a premium price tag of $599 but will deliver the best performance.